The wooden door to the lounge swings open. A mysterious stranger appears, silhouetted against the desert sun. His leather vest is dusty from years surviving in the Wasteland. Goggles and a bandanna obscure his expression, but you can tell from his posture he’s not here for conversation. He steps up to the counter, and when he grabs hold of the edge you notice one of his arms is actually a mechanical claw. 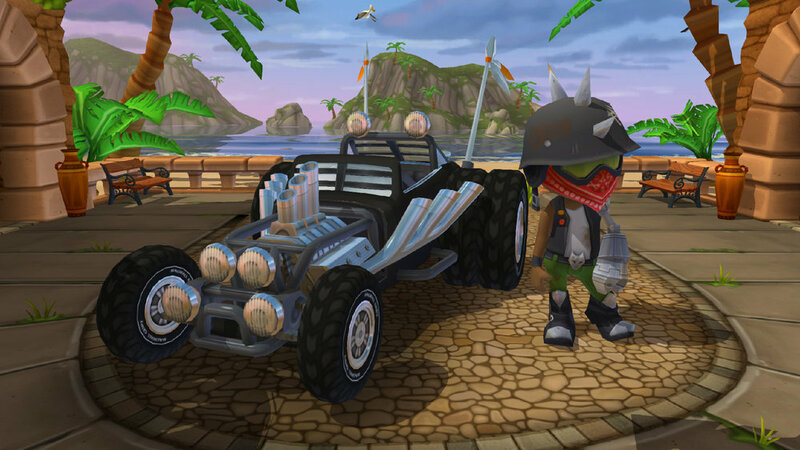 Like all characters in Beach Buggy Racing, Clutch has a special ability that gives him a unique play style compared to the other drivers. When he’s in the midst of a pack of rivals, Clutch can toss a hailstorm of gigantic cherry bombs all over the track. Ba-BOOM! It’s a fistful of chaos, and Clutch sails to victory through the midst of it all. Clutch isn’t all gruffness and ‘splosions, though. Beneath that tough exterior lurks a softer side. If you catch him alone, staring off at the sunset horizon, you might hear a snippet of desert poetry. Welcome, Clutch, to the pantheon of Beach Buggy Racers!